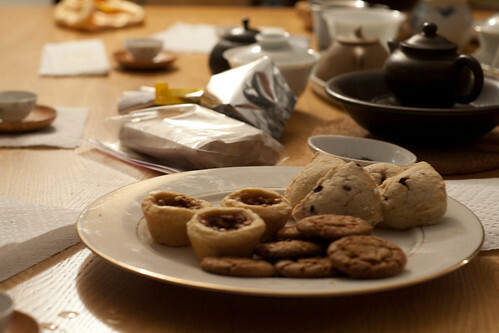 In search of the elusive Tea Pearl, brave friends gathered at The Tea Gallery for the first NYC Tea Meetup. Being the inaugural I decided to document this one in some detail - I expect that I may drop off sooner or later as the journal of record. This was a nice tea, whatever its source. Thanks to Tim for providing it. We returned to this tea several times. 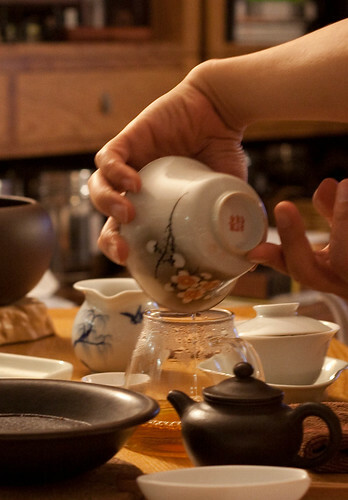 Winnie regained her chair to brew this Yancha in her own style. Roast was apparent but plenty of other flavors and a great mouth feel came along to the party. Brew #3 was knocked out of the park, but the tea dropped off quickly afterwards. The aroma of the tea was very impressive, changing from brew to brew but remaining vivid. For me this tea had a lot of "downer" qi. Dae agrees. I wonder what this tea would do if pushed hard. Michael returned home and took over brewing. Tim returned after fetching his friend Tony from Hong Kong - a friend rediscovered in NYC after 25 years. Best of all, Tony loves tea and was glad to join us. 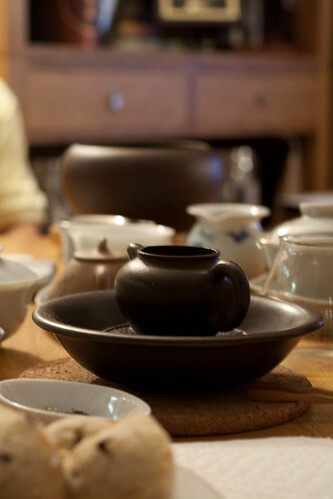 A vintage gaiwan was soon stuffed with wet, rinsed leaves. We drank this for several rounds in Michael's signatures knockout style before the leaf was fully open. Then, he started to combine two batches, to leave some in his new Yixing. Our organizers Mike and Katy furnished us with a fine selection of snacks to put off the munchies from Michael's powerful brews. Tim was too tough to partake in any snacks. The "bo'lay" was not too strong for Tony. He was well seasoned! Tim and I have been talking about this tea ever since Winnie mentioned it a few weeks ago. Now she is attempting to hide it from the tea drunks. The shy tea eventually reappears as a nightcap. 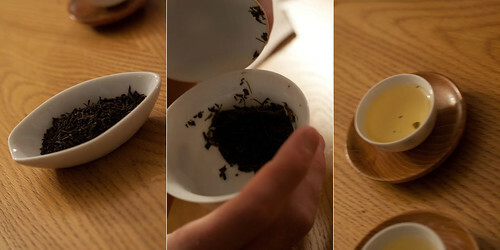 Dry leaf smells like black licorice certainly, but also something reminds me of the Long Jing Hong Cha experiment. Adrian thought that tea was more of a hei cha than a hong cha (fermented vs oxidized), and that is certainly the case here. 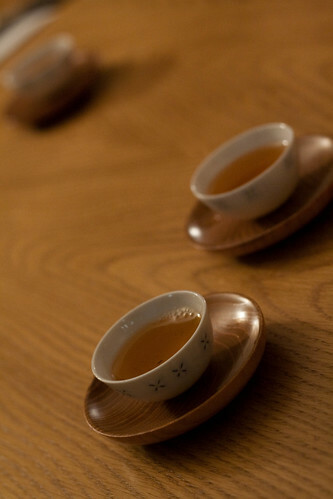 Wet leaves had a very intense aroma, Tim placed it as d'dok cha, a Korean puerh. Taste was smooth and light, hard to pick much out. This could be due to the small quantity of leaves used, but more likely because of the earlier abuse from Michael's 15 minute Bing Dao brew -- Time to quit for the evening.